Not to spoil anything, although spoiler warnings for this game are pretty much un-needed, as there’s..what? Five or six versions of this game, and it’s been out for 16 years. Anyhow, not to spoil anything, but this is an extremely good part of the game. This update contains a 7-minute long video. But, don’t view the video until after reading the update. Because the video is the gameplay behind this update. So, seeing it before reading would spoil the update. See? Anyhow, let’s do this thing! The air was tense. A great battle was upon us. A week ago, I would have killed the traitor that did this, and now here I am. THE traitor. I wonder who’s coming to kill me? An sentry broke my thoughts. “THEY’RE HERE!” Yang gave orders. “Hurry, meet them! Giving up ground is acceptable, as long as we manage to overcome them!” The troops came. 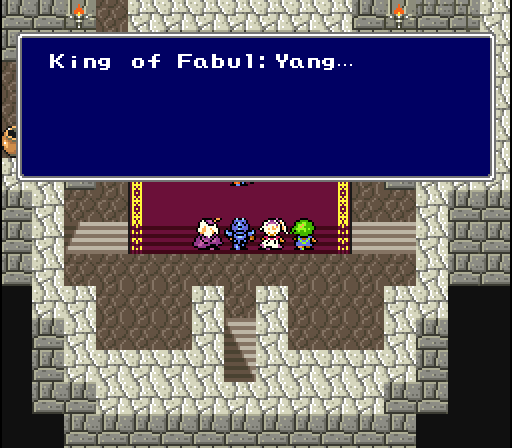 Yang, Edward and myself fought them off. Three more squads took their place. Oh no. I could hear the sound. I was used to the sound. Before I could speak, the sentry did it for me. “The Red Wings!” I looked to Yang. “Yang, we can’t take the airships. We’re a good match for the ground troops, but we cannot defeat the airships.” He nodded. “Quickly, men. Inside the palace.” We blockaded the hall before the throne room. “Cecil, I’m sorry I dragged you into a hopeless war against them.” I shook my head. “This is not just your war now, Yang. It’s become Baron against the entire world! Besides! We haven’t lost yet!” Another squad of troops. They were quickly dispatched. Again, three more took their place. Two warriors of Fabul were quickly killed. 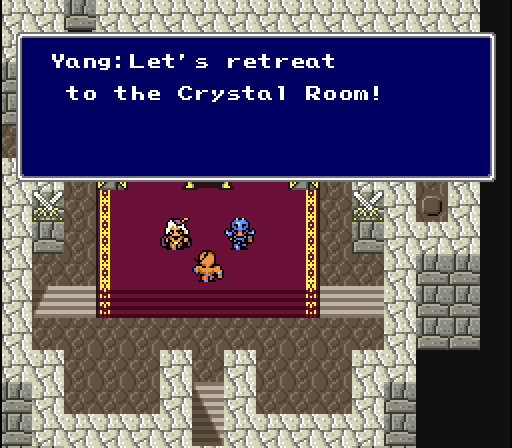 “We must retreat once more.” Yang ordered. 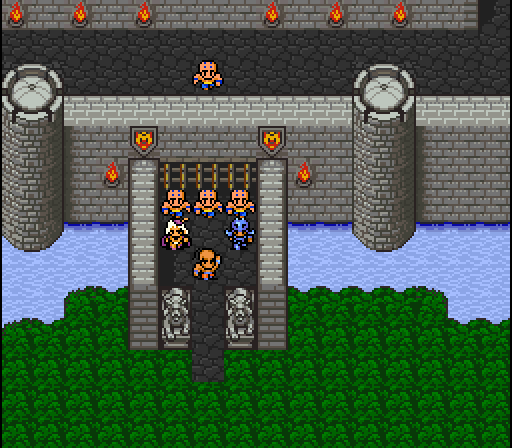 We were pressed against the throne room doors. “Worry not, Cecil. The king has taken refuge with the women and children.” That’s good. I wonder how Rose and Rydia are doing. “Attract the enemies, men, and…” A squad appeared as Yang spoke. He turned to face them. “SMASH ‘EM!” Again, we quickly dispatched the squad. Again, three more took their place. Edward spoke, a slight tremble to his voice. “We can no longer safely stay here.” Yang nodded. “I agree. We can lock ourselves in the throne room, it’ll buy us some time.” There we were. Boxed in the room. “Lock the door! We must defend this ground no matter what!” “Yang,” I asked, “Where is the crystal?” “In the room behind us, Cecil.” Hearing that, the lone warrior in the room turned and unlocked the door. “What are you doing?! Have you gone mad! ?” The warrior turned to us, pulling off a skull cap. He was really a baron soldier in disguise! “Quickly!” We quickly defeated him. Were we too late? It was the best idea at the time. We needed to defend the crystal no matter what. I finally nodded. “Alright.” We started walking, Yang in front of me, Edward behind me. That’s all we need to do. Defend the crystal. 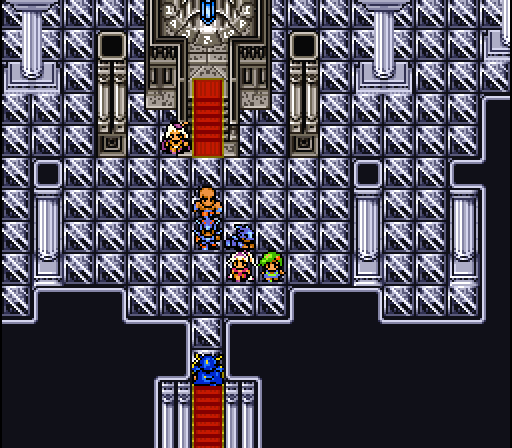 Make sure Golbez doesn’t get it. Edward’s cry suddenly took me out of my thoughts. “No!” I had spun in time to watch him fall. It happened in slow motion. He started falling. 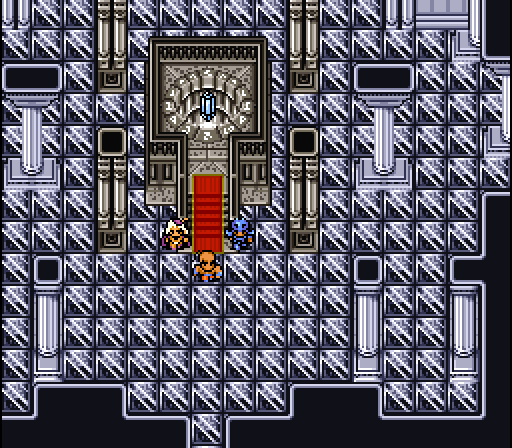 The door to the throne room opened. “Edward!” He was closer to the ground. The two Baron soldiers started to approach him. A thud. Edward had hit the ground. The world had went black. I could no longer see what I was doing. The sound of steel echoed from the soldiers. I was quick. My own personal steel was drawn. Clang. I felt pressure on my blade. I had deflected theirs. “Yang. Help Edward! I can only hold back the blades so long.” The world was returning. “Let us help you, Cecil.” Edward’s voice. “Alright.” The three of quickly took down the two soldiers. We headed to the crystal room. The entire update in video form. I cut the update where the video ends, because it was a damn nice stopping place. Previous: Chapter 3, Part 1. Next: Chapter 3, Part 3.